Your thoughts about money influence your ability to manage your money. Positive thoughts lead to positive money management behaviors. Negative thoughts lead to financial ruin. Try to maintain an open mind when you think about your finances, because your thoughts become reality. For example, if you think you will never have financial security, you may very well give up before you even begin to try. However, if you remain open to making changes in your financial habits, you’re more likely to succeed. Which reality do you want? You have the opportunity now to make changes that affect your financial life forever. Each of us, at one time or another, has experienced discomfort, stress, anxiety, or the feeling of ignorance about money. However, these attitudes and feelings change. Exploring your current attitudes about money is an important step in improving your financial education and situation. To help you figure out your current frame of mind when it comes to money, take the Attitudes about Money Quiz to determine how often the statements fit you — frequently, sometimes, or never. Don’t spend a lot of time mulling over the answer — just a few seconds on each question. And because your attitudes can and do change, respond to these questions as you feel right now — and go with your gut. 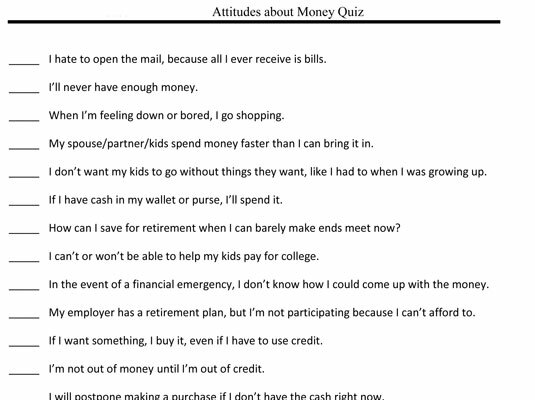 Click here to download and print the Attitudes about Money quiz. After completing this quiz, you should have a pretty good picture of your attitude and feelings when it comes to money. But to take it a step further, spend a few minutes writing about your current attitudes and feelings about money. This exercise can help you become more thoughtful and aware of how your thoughts and attitudes toward money may have evolved and how those thoughts and attitudes are affecting your financial life today.